I write from Ethiopia, some of my fondest recollections as I was growing up in the Faith. Born in a Hindu family in 1977 in Tamilnadu, India, I was brought up with religious consciousness. While a child, I used to keenly listen Hindu religious stories narrated by elders in my village. Movies and dramas of religious nature were my favorite. During the school days, I regularly followed religious stories published in the Tamil weeklies. After completing school, I shifted to Madurai city in August 1995 to pursue my bachelor degree. While pursuing my education there, I had a disturbing experience in September 1997. I was directing my efforts in looking for some inner peace while trying to seek wisdom for whatever happened to me. I then resorted to reading more Hindu writings published in the Tamil weeklies, and during weekends, I sought guidance from elders in Madurai city. I was regularly attending spiritual discourses. Yet all these efforts did not calm my inner agitation. I felt I was missing something altogether. My quest never ended. This was also the time when I had some exposure to other religions as well. Since January 1996, I was a member of an Inter-religious Group which functioned under support of Gandhi Museum in Madurai. The group organized prayer meetings each Friday, called as Sarva Samaya Prathanai, or prayers by all religions. Following recital of prayers from different religious scriptures, selected members of the group and other interested individuals will be invited to sing songs from different religions. I used to sing songs from Hindu religion, or even Islam and Christianity when followers of those religions were absent. Although a Hindu, I liked singing Tamil Muslim songs from the golden voice of the late Nagoor E. M Hanifa. My all time favourite was “இறைவனிடம் கையேந்துங்கள், அவன் இல்லை என்று சொல்லுவதில்லை” meaning “Raise your hands towards God, and He shall never deny your request.” For this open mindedness I had for other religions, I was requested to represent the Madurai Gandhi Museum at the world inter-religious conference held at Kochi in 1997. My father, a devotee of Lord Murugan, a Hindu deity, used to observe fasting and undertake pilgrimage every year to the Lord Murugan Temple in Palani, Tamilnadudu. My father had the ability to compose songs for the Hindu deities. As a four year old child I used to sit with my father and sing a couple of songs. I had a special audience to listen my tender voice. It had a kind of impact on me to intone the verses of God through music. Even as a 10thgrade student, the warden of our hostel encouraged us to conduct evening prayers everyday, where I used to sing songs from different religions. My childhood days laid a good foundation for me to love and respect all religions. It was during my Madurai days in 1997 that I came to know about the Baha’i Faith through Malaysian Bahai pioneers who came to Madurai in about October 1997. The group included Mr. Muniappan, Mrs. Parvathi, Mrs. Pushpa, Mrs. Nirmala, Mr. Kumaresan and Mr. Karunanithi. 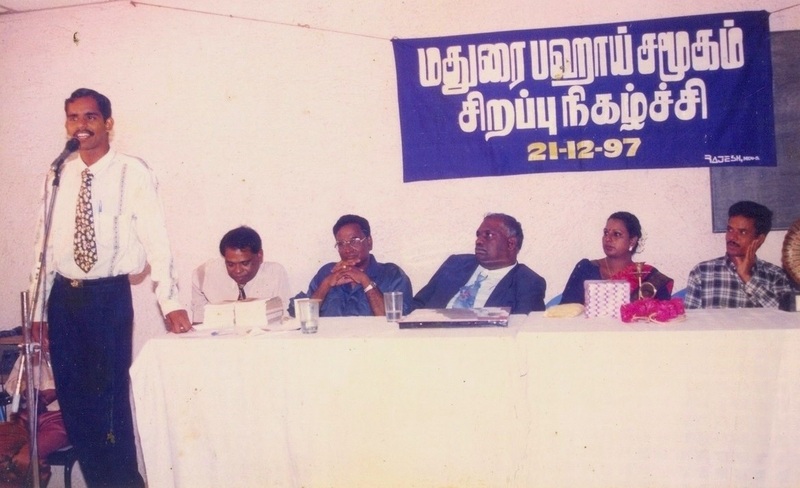 At that time I was an active member of Individual Development Centre (IDC), a forum run by friend and lawyer Mr. Ganesan. This forum was for personality development, focusing on the professionals and entrepreneurs in Madurai. The Malaysian pioneers were introduced to Mr. Ganesan. With that, I too naturally came in contact with the Malaysian pioneers, who stayed near my college and started teaching the Baha’i Faith. They established a Baha’i Centre nearby. When the pioneers told me about the Baha’i Faith and its principles, it struck that this was what I had been looking for. Since my childhood, I was totally against discrimination of people based on the caste-system that was utterly destroying the fabrics of the Indian society.I was looking for a new world order to be governed with great and sound principles, and to me I felt that the Baha’i Faith provided them.It broadened the horizons of my religious understanding and showed the thread that connected all the past prophets through progressive revelation. At last here came the right prescription for a fast failing world through the clear teachings of Baha’u’llah. I immediately accepted the Faith. As soon as I accepted the Baha’i Faith one of the Malaysian pioneers told me,“It was your destiny. Baha’u’llah knew you even before you knew Him.” I had a personal rapport with Mr.Muniappan, team leader of Malaysian pioneers, who used to give lectures in different schools and clubs. I used to arrange these programs and document them. After few months, these pioneers left and new team of pioneers came. After accepting the Faith I then moved to Chennai for education. This is the Baha’i center where the office of Tamil Nadu State Bahai Council (SBC) is also housed. Here I had a chance to meet and interact with a number of dedicated believers including Mr. N.C. Baskaran, Mrs. Kala Baskaran, Mr. Selvanathan, Mr. Rasheed, Mr. Sundaravathanam and Mr. Mahendran. Occasionally, I had a chance to meet Bahai friends from Malaysia such as Mr.Manisegaran, Mr.SinnaMuthu and Mrs.Susila. They played a pivotal role in deepening the believers in Tamilnadu, and I too basked under their knowledge. I visited the SBC office in Chennai during the weekends to assist in the office work, that included writing and translating letters and posting newsletters. I had good exposure to learn the way Baha’i administration works. While my regular visits to the SBC office deepened me in the Cause, a true turning point came through a two day intensive class on Kitab-i-Aqdas conducted by Mr. Manisegaran at the Baha’i Center in Chennai. I actively involved in many activities through the State Baha’i Council. In Tambaram, where the Madras Christian College in which I studied was located a new Local Spiritual Assembly was established and I was on the assembly. 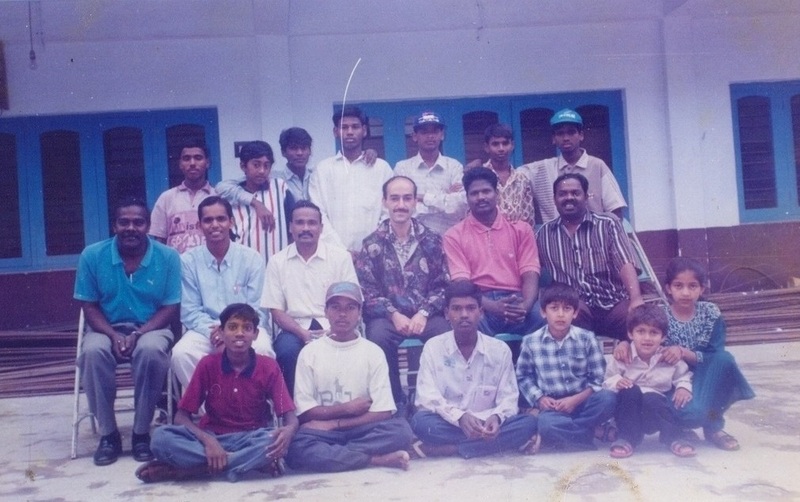 I was part of a group of volunteers teaching the Faith in Trichy in 1999 and in Ooty in 2000. I also attended the Youth Summer Camp in Ooty in 1999 and that camp deepened me further. Auxiliary Board Member Behrouz gave very inspiring talks. More than that, it was a new experience as the participants were able to move closely as members of the same family, something unusual in a caste-conscious Tamilnadu. 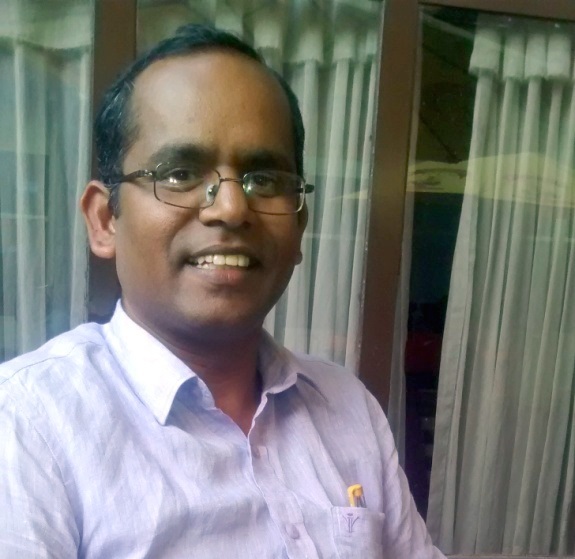 When I was in Trichy, I met Mr. Karuppiah, a devoted Baha’i volunteer from Pudhukottai. He taught me the Faith more intensively. He had a huge collection of some hand-written notes, marking the important points in different colours. He used to highlight the connection between the writings and the important happenings in the world history. Unfortunately I never had a chance to meet him again to gain more knowledge. With all these exposures in the Faith, I had become a transformed person. When my family invited me to come home to perform certain rituals under the Hindu tradition, I was put to my first test- a test coming from my family itself where I was brought up the Hindu way. I discussed my predicament with the Bahais and they gave me the needed advice and guidance from the Baha’i writings. I sent the night praying hard to relieve me from my agony. The following morning I pulled up my courage and wrote a letter to my family about my inability to perform those rituals. It was a carefully written long letter that laid down all my reasoning. They were shocked at first, but gradually they came to accept that I was treading the right path. When I visited them later, I found that they never forced me to perform any rituals. But I overheard them conversing that they were happy to see some good changes in me. 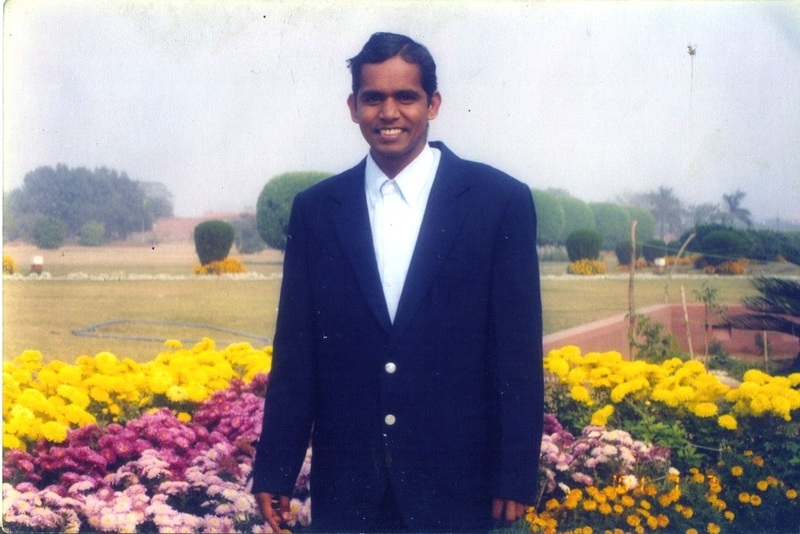 After a two year stay in Chennai, and with the completion of my Master degree, I decided to move to New Delhi to become an Indian Administrative Service Officer. Initially, I served as a volunteer in the Baha’i House of Worship for a month, meeting many people coming from Tamilnadu and elsewhere, to whom I taught the Faith. I had the bounty of translating the revised version of information sheet given at the temple from English to Tamil which was sent to SBC, Tamil Nadu for approval by the Temple Secretariat. The information sheet is being distributed for the visitors to this day. I used to read from the rich collection of Baha’i literature in the Temple library. Ms. Nanda, the then Librarian always helped me in suggesting books and guiding me, and told me very interesting and inspiring stories from Bahai history. Even now I feel that how I was lucky to meet such noble souls.At the end of my service at the temple, I sent to the SBC of Tamilnadu a long list of people who expressed interest to know more about the Faith. The list included ministers, senior government officials and people of capacity from Tamilnadu. Later I joined the Jawaharlal Nehru University in New Delhi to continue my higher education. I used to visit the Baha’i Temple on Sundays for prayer sessions. After the prayers, I used to serve as volunteer for that day. On Sundays the number of visitors was usually more. It was while serving here that I was put to another test. Gradually, I stopped attending prayer sessions and Feasts all because I was hurt by an immature member of an institution at a function. It was a personal matter and had nothing to do with the Faith. For the eight years I stayed in New Delhi I kept away from Baha’i activities. My focus was on the outside world, seeking worldly leadership. I contested the elections in the University and I won. That boosted my ego. Now the turning point came. Baha‘u’llah made me a target of His mercy by sending me tests after tests. Many incidences happened one after another successively and taught me bitter and heavy lessons that drove me back to my ultimate refuge- the Baha’i Faith. I was driven away from the activities on account of a misunderstanding I had with an individual. How could I blame the Faith. I should have differentiated between individuals and institutions. It occurred to me that it was immaturity on my part to keep away from activities. The tests opened my eyes and I was back to the fold. After the completion of my Doctoral studies, I got a chance to work in Africa as Assistant Professor of Public Administration in a government University in Ethiopia. I was so excited that I did the packing of my personal effects. Upon arrival in Africa I concentrated on establishing myself and did not identify myself as Bahai, but kept a low profile. Within a couple of years, unexpected turn of troubles surfaced their ugly heads. This time they were worse than what I faced in New Delhi. For some initial years I was experiencing a series of problems, crises and disasters in both my personal and professional lives. It reached beyond my ability to manage and control. On a particular night when I felt very disturbed and distressed I unconsciously started calling the name of Baha‘u’llah several times. When I came to my proper sense I started reciting Tamil prayer for assistance, which I had committed to memory. As I was still in panic and fearful, I was sweating profusely. Something within myself urged me to remember the name of Baha‘u’llah and forced me to surrender totally and unconditionally to Him. I realized that He was my only guide and refuge during that moment of heedlessness. Next morning I woke up as a different person. I uttered the greatest name several times. Somehow I got hold of the Paris Talks. While reading the Paris Talks, I came across this striking verse: If we suffer it is the outcome of material things, and all the trials and troubles come from this world of illusion (Paris Talks, p.84). Yet one more moving passage was this: While a man is happy he may forget his God; but when grief comes and sorrows overwhelm him, then will he remember his Father who is in Heaven, and who is able to deliver him from his humiliations (Paris Talks,p.32). Reading that book was an eye opener. It dawned upon that it was the attachment to the temporary and mortal things that pushed me to face crisis after crisis in Africa. After reading this passage from the Paris Talks I discovered the one more major mistake I made in my Bahai life. Reading Baha’i books alone was not sufficient. We are told to read the writings in the morning and evening. But I had lost in touch with the prayers books in Tamil since ten years ago. All I had with me were a few prayers that I had memorized, but not the prayer books. It had been some years since I prayed ardently. A great sense of guilt swept over me. A Malaysian pioneer presented me with a prayer book in the Tamil language. That book had a large selection of prayers, including the Long Obligatory prayers. When I came to Africa I did not bring it along. With that my daily obligatory prayer also ended with my Tamilnadu days. I felt that not saying sufficient prayers, and especially the Long Obligatory prayer could have been the cause of my dampened spirit. Upon deep reflection I discovered the root cause of all my troubles. While I was hastily packing all the important things to leave for Africa, I had forgotten to include the most important treasure- Baha’i books, especially prayer books. These days, the prayer books take precedence over passport when packing! I made several attempts to retrieve the prayer book from Tamilnadu but I had also lost communications with the Bahais in Tamilnadu. For a couple of months I prayed with a few lines that I had memorized. That was not quenching the thirst of my soul. Many times I searched Tamil prayers in the internet. Finally, I got some Tamil prayers in a popular Bahai website, hosted by Mr. Ramasamy Palaniappan, a Malaysian Baha’i. I requested him to upload the Long Obligatory prayer in Tamil. He was so generous that he posted to Africa a prayer book and other important Baha’i readings.They came as the best healing medicine for my thirsting soul. This time, I was urged internally to visit the Baha’i House of Worship in New Delhi. In September 2012, I visited the temple. I sat down inside the prayer hall for several hours, praying and asking for pardon, guidance and strength, with tears flowing down my cheeks. I felt like praying for hours and hours, when finally the volunteers requested me to leave since it was the end of their working hours. I was the last to be led out of the temple. I stood on the road looking at the temple for a long time, praying and seeking His blessings. The next morning I came back to the Temple. I met Mr. Javid, the Manager of Baha’i House of Worship. He gave me couple of books written by John Huddleston. Upon my return from New Delhi to Africa, many positive things started happening miraculously in my life. I inserted my religion as “Baha’i” in my Facebook account to initiate connection with Bahais across the globe. I decided to meet more Bahais daily and involve actively in Baha’i activities, as I had done earlier in Tamilnadu. But I did not know the starting point. One day I was traveling in a local bus in Addis Ababa, holding a Baha’i prayer book which had the picture of the Baha’i House of Worship in New Delhi on its cover. Someone sitting on the opposite side in the bus spotted that and asked me if I am a Baha’i. He then introduced himself. What a blessing to be contacting the first Ethiopian Baha’i on that bus journey! And he was the first Baha’i I ever met during my stay for four years in Ethiopia. His name is Mr. Ermias. We excitedly exchanged contact details. A new life had dawned for me. Through him, I visited the office of National Spiritual Assembly of Ethiopia and met some members of Bahai community. I renewed my link with the Faith. During the days when I was not contributing for the funds I did not have any savings in my account, although I was earning good salary. But now I started contributing. One day while casually checking my balance, I realized that my savings had increased tremendously. This was the new beginning of life of miracle upon miracles befalling my Bahai life. With all these happenings, I reflected on why I experienced all these problems and sufferings. The answer was as clear as broad daylight. Whenever I moved away from Him, He sent me sufferings and tests to teach me a lesson. Those lessons brought me closer to Him again. Finally I surrendered. The sufferings reinforced my faith in Him. On His part He showed me the power of His Divine Assistance. He guided, blessed and protected me. The comfort and happiness I have today are attributed to His immense Mercy, and not because I deserve them in any way. The rough and tough life I underwent revealed to me the bare truth that He and He alone could rescue me in times of total heedlessness; and He and He alone could give me the needed strength to withstand the pressure from violent tests, trials and tribulations. The best is to surrender oneself to His will. Today my only desire is to dedicate my remaining days for the promotion of His glorious Cause.